LeFay is a street-wearable art brand based in Bristol, England. Launched earlier in 2012 by an artist/fashion designer, Katie Smith. The brand is inspired by the desire to decorate the body, as Katie is a practicing Henna Artist that has been spending the last four years by the beach decorating the bodies of tourists who flock to the coast in the summer season. When Katie isn't working hard in the LeFay studio, she is either cruising on her skateboard, snowboarding when the season allows or surfing to get her ocean fix, all of which play an important part in the design process. Katie was inspired to produce a clothing range that you can wear anywhere, from high-street to the beach. With the focal point on the art applied to the designs Katie always creates by hand using minimal use of technology allowing the artwork to be as raw as possible from the creation to being available to buy online. The SS12 collection is inspired by 80's skateboard art, henna body art, the female form and journeys into the unknown. The fabrics used in this collection are all cotton, allowing the clothing to breathe as well as being easy to wear time and time again. 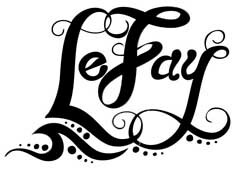 Like to waves that ebb and flow, so does life and LeFay ladies go with the flow. For more information about Lefay or to shop this season's collection check out www.shoplefay.com or "like" the LeFay facebook fan page.